Welcome on the official website of the Belgian Society of Internal Medicine. 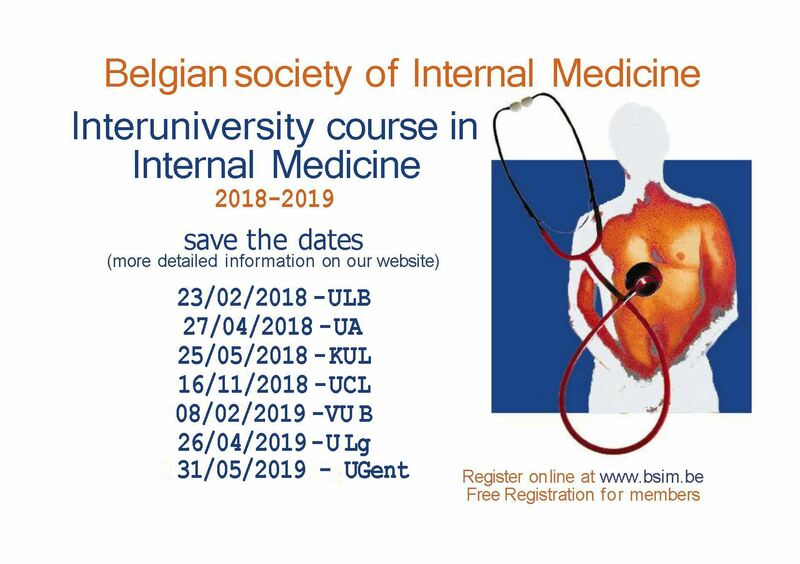 BSIM is a scientific society that aims to foster the development, dissemination, research and education of general internal medicine in Belgium. The different activities organized by BSIM are displayed on this website. The scientific journal of the society is the PubMed indexed "Acta Clinica Belgica". BSIM has also joined forces with the Professional Union of Internal Medicine (BVS-GBS) in order to optimally support the practice of internal medicine. Therefore, one could consider BSIM to be the voice of the internist in Belgium. We surely hope to have the occasion to meet you as a BSIM member on one of our activities! The President of the Belgian Society of Internal Medicine. We thank you for your participation to the “choosing wisely survey” by the Belgian Society of Internal Medicine. The analysis of the survey has resulted in a “top 10 list” that will be soon published on the website. On the occasion of the forthcoming European congress of internal medicine to be held in Milan, a working group of the European Federation of Internal Medicine (EFIM) will gather to further discuss the development of a European “choosing wisely” campaign. More information can be found at www.efim.org.